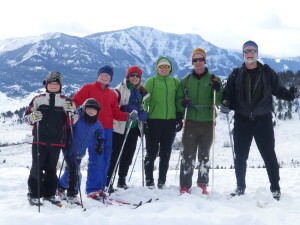 We enjoyed a wonderful family time in Montana with the unseasonably warm weather. 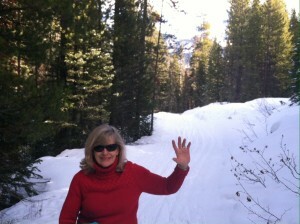 We stayed at a cabin in Silver Gate near Cook City and skied in Yellowstone with Aaron and Lynelle and grandsons. It was a late Christmas celebration. We had no Wi-Fi and no telephone service… just electricity. It’s the greatest way for family bonding. Praying with your kids and grandkids is important but playing is as well. I have memories of running up and down playground equipment playing tag. Larry has been described as a little boy in a big boy’s body. Camping is another wonderful way to bond. There is something wonderful about our memories of camping at Devil’s Lake while sleeping out under the stars as a family. But we have even slept in our backyard minus a tent well before mosquito invasions. I guess the main point is breaking the routine. Yes, the family that prays and plays together stays together. Now how do you create memories with your loved ones? Ever Try Building a Snow Cave? 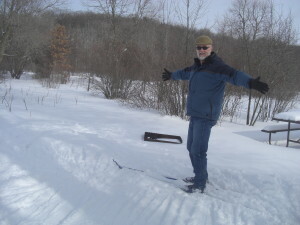 This past week’s weather brings back memories of the winter of 1978. The ample amount of snow and cold made it a record breaking winter—the kids had four days off of school. Larry ordered a sewing kit from Frostline to make his own sleeping bag and coats for the kids. Yes, Larry is the seamstress in the family. Construction of any sort is his forte. After constructing his sleeping bag, he wanted to test it out to see if it was really good for -20 degree temperatures as it claimed. So he built a snow cave in the front yard of our house on Rt. 31 in Crystal Lake, IL. We had so much snow the winter of 1978 that the kids could jump off the garage into large snow drifts. Our mailbox was decapitated by the snow plow — we just stuck the poleless mailbox in the drift and got our mail that way. The snow plowers were so far behind in getting to their customers that Larry had to cross-country ski groceries to our friends trapped in their home. But Larry was made for winter. He relished in it and always grew a beard in the winter to keep his face warm. It didn’t take him long to build a prize-winning snow cave. He kissed me and our three kids good night and off he went into below 0 weather to test his new bag. Samson, our trusty St. Bernard, lay at the front door as a guard dog in case of an Eskimo invasion. I was warm and comfortable under my blankets thanking my lucky stars that I didn’t have to join him in this experiment. By 5 AM I heard the door open and my 6′ 2″ husband now in the shape of a pretzel and frozen like a popsicle snuggled up to me and awakened me with frozen pea like toes on my warm toasty legs. 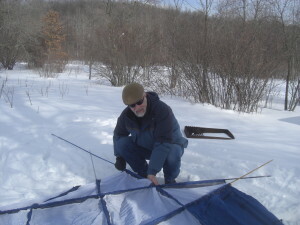 He then said,” My knee was bothering me too much to stay out all night.” When adventure doesn’t come to you, make your own by winter camping in your front yard. You too can freeze almost to death and live to tell your grandchildren. Stay tuned in—there were other winter camping experiences that I did not escape. All little boys growing up in the 50’s were influenced by the cowboy characters, Roy Rogers, Hopalong Cassidy and John Wayne. The good guys wore white hats and the bad guys wore black. Of course, both were always fighting the Indians. Larry, whose nickname was Skip, was no exception. He and his two younger brothers, Bill and Ken, were glued to the TV screen soaking up the many lessons to be learned about how to be a real cowboy. They were thrilled to have electricity and a TV in their small primitive summer cottage supported on posts. It was located in Lilymoor just outside of McHenry——a better place than the city for three boys to grow up. In 1952, Skip’s dad bought the summer cottage from his half-brother who used it as a flop house, a place to get inebriated on the weekends. The goal was to convert the summer cottage into a year round home. Insulation, heat and indoor plumbing were non-existent, and they had to take a bucket to the hand pump on the front porch to pour the water down the indoor outhouse to flush it. The wood burning stove sizzled with scraps Skip’s dad brought home from his carpentry jobs. “We’d wake up in the morning to snow on the floor,” Larry recalls. “With room for only one bed, we nestled close to one another for warmth. For Christmas each of us received two presents—-a piece of clothing and one toy and when the VFW came to the door with a turkey and a box of food, I saw my dad cry for the first time, “said Larry. Larry’s dad, a man whose arms resembled Popeye, dug a well and installed a pump by the sink in the kitchen similar to what we had seen on the TV series, Lassie. After the wood stove was installed, the next ongoing project was to dig out a basement under the house. First, walls with windows were built. When Larry and his brothers got home from school, their job was to remove five wheel barrels of dirt through the basement window where later it would be hauled to the dump. This was a Herculean task for three young boys. But at least the cottage was theirs, and the TV provided a mental escape to help them endure. There were trees to climb, sticks to turn into guns and plenty of new places to explore. 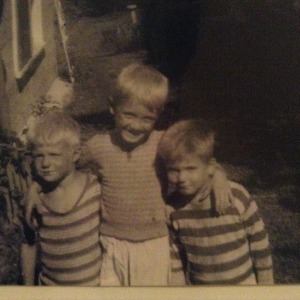 Ken, the youngest of the three, was often the target for taunting. When it was Ken’s turn to swing from the rope on the tree, Skip the chief, would tell him when to jump. Of course, the oldest brother was always right. “Not now,” screamed Bill and Skip. With their early understanding of physics, they would wait until the distance between Ken and the ground was greatest and then they would yell, “Now”. As would be expected, they all got wounded regularly just like the real cowboys and Indians on TV and Dad, the medicine man, was an expert at making butterfly bandages. Going to the hospital was out of the question. Another time, they ventured into a dairy farm behind them and visited the cows. Bill and Larry talked Ken into grabbing the tail of a Holstein cow to see what would happen. When the thrill of seeing their brother fly on the end of a cow’s tail passed, they yelled. But the shock of being dragged by a moving cow, made Ken grab on even harder. “Let go,” yelled Bill and Skip even louder. But Ken continued to grab on even harder as he bounced off stones, sticker bushes and manure patties. Now that was enough adventure for the day. Rainy days were really a recipe for disaster for the growing family who lived in the space of a double garage. Mom and Dad were playing cards with friends down the road and the three got to rough housing. It wasn’t long before they put a hole in the thin wall. “Mom is going to kill us?” they screamed in unison. Skip came up with an excellent solution. They would move the refrigerator to cover the hole——-Mom and Dad would never notice. With a great deal of pushing and shoving, the hole vanished behind the mayonnaise, mustard and sour cream. When Mom and Dad came home, they asked who moved the refrigerator. That left their little sister, Mary, cooing in the corner. Digging out the basement was an ongoing project. By then real plumbing was installed and Shirley, their mom, decided to have a Tupperware party. The memory was crystal clear in Skip’s mind and he diverted his attention from throwing dirt out the window to digging a large hole. He coaxed Bill, the cowboy, into climbing into it. Bill obediently jumped in. The Indians, Ken and Larry, buried their victim up to his neck. All they needed were cowboy hats and feathers—–until Bill’s piercing cry. Ken ran upstairs and whispered in his mother’s ear. “We need you downstairs,” said Ken as innocently as possible. “We buried Bill,” said Ken. Stomping down the basement stairs, the first thing she saw was Bill buried up to his neck and then Skip standing in the distance with a shovel trying to be an innocent bystander. The spell was now completely broken—–the Calvary had arrived. She shoveled some more while Larry and Ken flew up the stairs at a speed that would have given the FLASH a run for his money. Two weeks in the woods might give their mother time to settle down. They remembered many episodes about how to live on roots and bark. But it wasn’t long before the Indians, forgetting the pain, escaped into the wonderful world of Roy Rogers, Dale Evans and Tonto—–with visions of future exploits dancing in their heads. 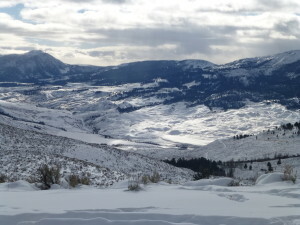 A favorite place for us to camp when we are in the Bozeman/Livingston area is in Hyalite Canyon. In the springtime when the water is high, there is a spot in Chisolm campground where our grandkids August, Jasper and August like to fish with their Grandpa Lou. It’s a place where the creek comes in and it’s a supermarket for catching large cut-throat trout. Now the grandkids are fortunate because they have two Grandpa’s who like to fish—–Grandpa (Owie) Larry is a fly fisherman and Grandpa Lou is a spin casting “dirty worm dunker”. We were out on our summer visit to spend time with our Montana grandkids. The oldest, August, hit a snag and didn’t want to snap off the hook. “I’ll wade out and clear the snag,” said Grandpa. It had been thigh deep which is perfect when wearing waders. “ I started to walk out and found out why there were so many large fish congregating,” said Grandpa Larry. “I took another step and discovered the second reason why the fish were so large. On the third step, I discovered the second most important reason why the trout were hanging out there when I went from knee deep water to water that was frigid and over my head. Trout love deep holes and I found a very deep hole. The first was the in-coming creek which washes in insects that the trout feed on and the second was With one step, I went from knee deep to water over my head. 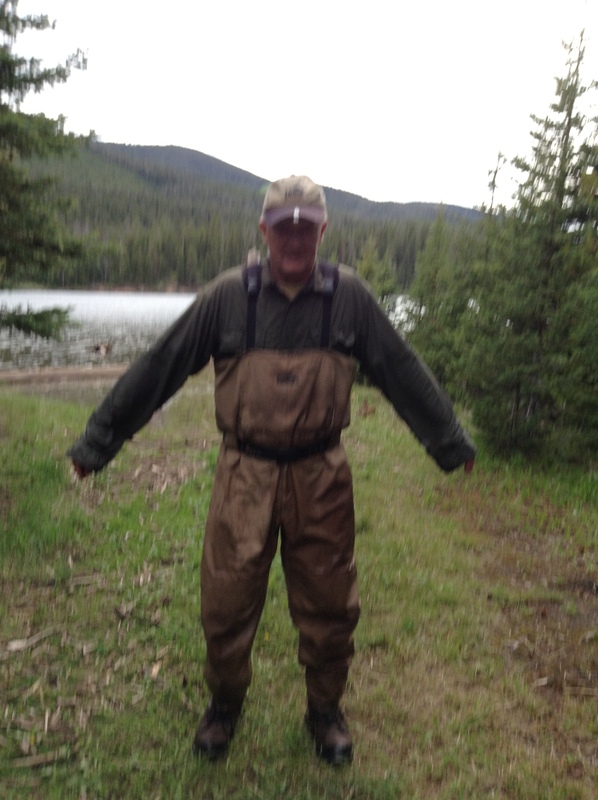 Fortunately waders have a waist belt and an elastic cord around the top of the waders. Both are designed to keep the water from rushing in. But regardless, as I crawled my way to the shore, frigid water began to trickle into my waders and ran down into feet. Whatever water comes in stays in. My grand kids roared with laughter to see my demise. But all’s well that ends well. In honor of Deborah Lynn Schuerr’s birthday on October 24th, I share my next Life with Larry story. One afternoon, I was giving Deb a piano lesson. Getting her to practice was like getting a fish to swim in water. She loved playing. I sat next to her on the piano bench as she was playing a classical song. Then all of a sudden, we were interrupted by a loud boom that shook the house. We looked at one another and said, “Daddy’s Home”. Yes, Larry had pulled into our down-sloped driveway and threw the clutch into what he thought was park. But somehow he missed the gear. The van was on a run away course and quickly picking up speed. “My first instinct was to try to stop it,” said Larry. “But I soon realized tangling with a flying van was not going to make me the winner. I watched helplessly. Fortunately, a newly planted evergreen slowed down its momentum and it clipped the side of our attached garage with a two foot gash in the wall.” Being a builder/carpenter at the time, Larry cleverly turned the gash into a plant holder. It ended up being a life lesson for the family. Life can throw us some curves but we can always learn and grow from them. Today Deborah plays not only the piano but violin, and many other instruments. 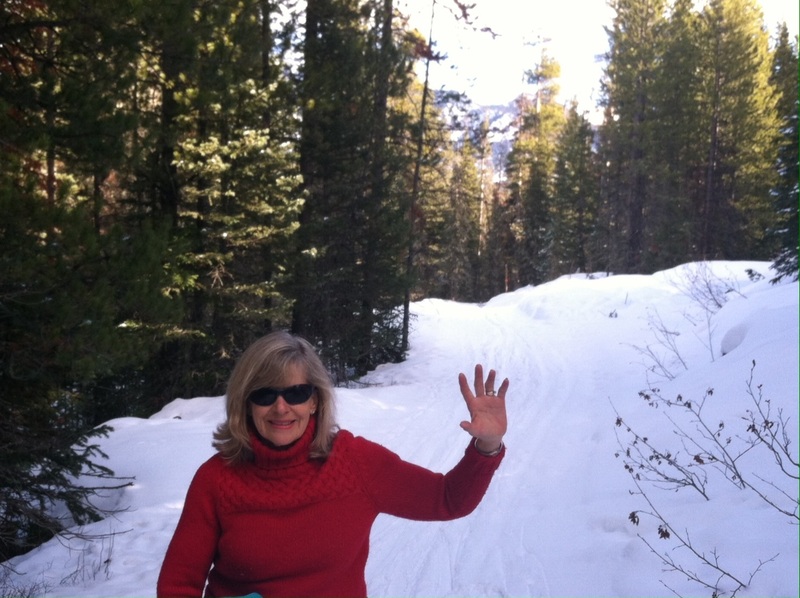 Deb teaches music part time at Headwater’s Academy in Bozeman, Montana and gives music lessons to 48 students. My mother, Alice Gram, was a music teacher and organist at the Lutheran church we attended. She inspired our love for music. On Thanksgiving and Christmas, we would gather around the piano and perform Fiddler on the Roof. I would play the piano and Deborah played the violin and Julie the flute. My brother Bill, who has a voice like Frank Sinatra, would top off our occasion singing “The Old Man River”. He now says,” I am the old man river”. Aaron would sit at the piano and play jazz while Larry played his favorite instrument—the radio. 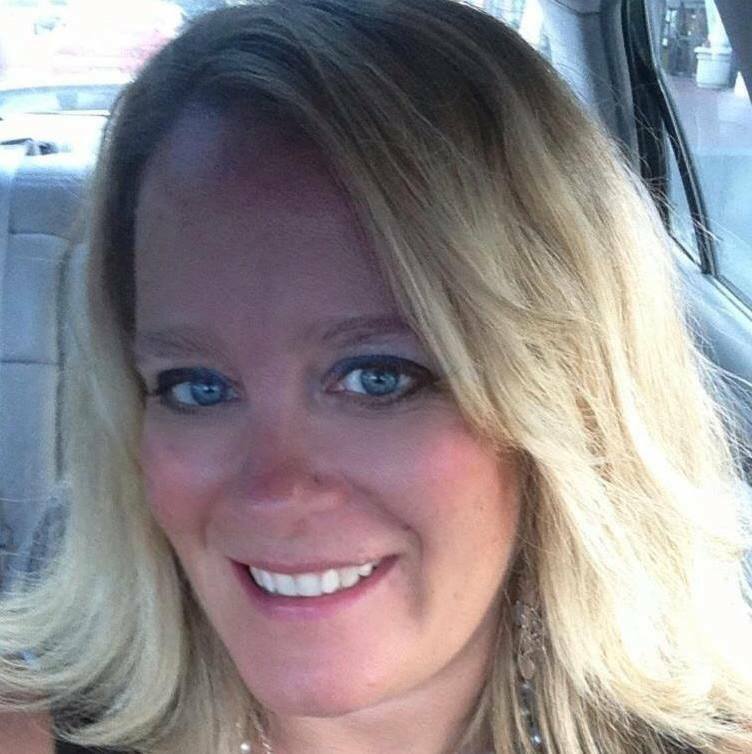 Happy Birthday to our first born—Deborah Lynn. May the love of music continue through the generations. The crystal clear water of Devil’s Lake, a hidden jewel in Wisconsin, is surrounded by high bluffs which are magnets to hikers, campers and rock climbers alike. My husband, Larry, and I were fortunate to find an available campsite on a picture perfect weekend. We set up the tent just in time to enjoy watching the birds fly over the breathtaking pink and purple sunset. We eagerly looked forward to our friends, Lola and Thom’s, arrival so the hiking, biking and, most importantly, laughing around the campfire could begin. Then I heard a sound that changed everything, “Bang!”Larry shut the door of our 2000 Windstar Ford van. I heard him gasp in shock, “Oh rats! I thought I was unlocking it, not locking it. I left the keys in the van.” “How could you do such a thing?” I moaned. Sure enough, there they were, laid out between the seats, resting like a silver trout between two pond cup holders. And, as luck would have it, our spare key – tucked under the right wheel – had long since disappeared. In less technical days, opening a locked vehicle was so much easier. Back when I taught ESL classes at a synagogue, a student from India came to class frantic because he had locked his keys in his car. I promptly marched into the synagogue kitchen and retrieved a handy black spatula and proceeded to squeeze it through the rubber between the windows. Voila, the car opened. Another time Larry locked the keys in our Ford station wagon. A group of foster teenagers Larry invited camping with us opened it with a coat hanger. But with computerization, the days of opening cars with a spatula or coat hanger have ended. Not accepting defeat, I walked around the van a couple of times, before observing one glimmer of hope. The back vent window was opened about two inches. I also noticed a group of male campers toasting their feet around a cozy campfire, after what looked like a fruitful day of fishing. Normally Larry is a good problem solver, but for some reason this one stumped him. Having given up hope, Larry saw no other solution but to borrow our friend’s car to retrieve another set of keys. I grimaced at the thought of an unnecessary six-hour trip. What a way to ruin a beautiful weekend! The ideas continued to swirl from one camper to the next as our plan unfolded. Eventually we decided to tie a treble hook to a twelve inch long piece of fishing line, which we duct taped to the end of Larry’s tent pole, turning the pole to wind the line around it. Where would mankind be without duct tape? Move over Rover, duct tape is now modern man’s best friend. Getting more excited by the minute, Larry and the fishermen continued to pool their ideas. Larry, our appointed fisherman, assigned us our positions as we prepared to go for the keys. Fishing for car keys – how absurd was that! My job was to stand by the side of the van with a flashlight, while Larry blindly and painstakingly fished his way through the back vent window to the front of the vehicle. He manipulated the fishing rod up and down with help from the campers. We were all tense and focused as we engaged in our most unusual fishing venture. As the typical fisherman’s wife, I really didn’t have much hope for its success. But I watched in wonderment as these men maneuvered the pole until it finally hovered over the steel fish–our keys. I watched as the lure made its first scooping attempt, about an inch shy of the capture. “Try again, Lar. This time more to the right,” I said. He lowered the hook and unwound the line. After a couple more tense tries, I watched in disbelief as the keys flickered in the moonlight, drawn up into thin air. My heart raced and my stomach did summersaults as they worked the pole backwards. The fishermen were delighted at the capture, but they didn’t see what I saw – the potential entanglements, including: tossed clothing, camping supplies, and the velour seats, any of which could so easily ensnare our coveted prize. Touch anything and we’re cooked. I continued directing the blind fishermen to move the pole in such a manner as to avoid entrapment. With a sense of empowerment, I was the Siren commanding my ship of male servants who were painstakingly following my directions. I relished the fleeting moment. In sheer delight, I saw the keys within inches of the vent window. We were breathless with excitement. Handing the flashlight to one of the fishermen, I wedged my tiny fist through the vent window, capturing our prize. We all jumped up and down in disbelief, and our shouts of triumph could be heard throughout the campground. Where was “America’s Funniest Home Videos” when we needed them? Did we really fish for keys? Larry, having redeemed himself, proved to be an excellent fisherman, though not without his team and sheer luck. Lola and Thom pulled up, wondering what was causing all the commotion. They were not surprised to hear Larry had locked the keys in the van. He was known for creating problems that required fleets of fishermen to solve. Enjoying the beauty of the evening and huddling around the inviting campfire, we laughed about our most unusual fishing venture. We already knew–it was going to be a weekend to remember. Sunset Beach in Fish Creek/ Peaceful? At Sunset Beach in Fish Creek crowds gather for the big event—watching the glowing sun disappear over the Lake Michigan horizon where earlier we saw pelicans flying like pearls in the sky. Parents and children skip rocks and lovers embrace one another while gazing at the halo of orange and pink. Larry and Sue along with three female friends are ready to join the crowd for applause that begins with the sunset. Somehow Larry got on the topic of hunting remembering the nightly jaunts of the deer crossing our yard nibbling our flowers and shrubs on their way to a save haven of soft underbrush where they nestle for the night. Our son, Aaron, is a hunter because that is what one does in Montana to get meat for the year. Larry has always longed to join him but the cost of the tags are too expensive. Over the past five years, we have seen the deer population grow exponentially in our suburban neighborhood. Waiting for the sun to set is a celebration anticipating the guest of honor to arrive. The joyful atmosphere transforms strangers into friends. The picture changed abruptly as Larry explained loudly how he would love to hunt Bambi in his own backyard but he said, “My chances of killing a deer with a single bow would be close to impossible. An arrow would slow it down, but then I’d have to chase it through the neighborhood with a knife and slit its throat. I don’t think the neighbors would appreciate that very much.” The mental shift from a setting sun to a slit throat causes us to cringe. The man on the rock below us was squirming while eavesdropping. Next, we drove into town to get ice cream when Larry suddenly pulled over to the curve and parked. He then took us to a circle of lilacs and told us to breath deeply. “It’s the most pleasant aromatic smell. Isn’t it wonderful? I just love it and had to share it with you,” said Larry. Yes, Larry hasn’t hunted anything more than a pheasant and cries first at the movies. My former Marine husband will stand up for the needy and oppressed, yet he will stop for a sunset and to smell lilacs—–the many faces of Larry. When you see signs labeled Bad Ax River and Lone Elm Tree road, it’s a clue you are no longer in the northwest suburbs of Chicago. Actually, we were in the outskirts of Prairie Du Chien. It’s where the Mississippi and Wisconsin River meet. Our mode of transportation was a 1981 Honda motorcycle loaded with everything we would need for a two day adventure. You might call it a midlife crisis, but then no one lives over 120 years unless they are eating Dannon yogurt in some remote village in Russia. Yes, after twelve years of begging and the sky high prices for gasoline, I finally gave Larry permission to buy another motorcycle. Permission, you may ask! Well, Larry crashed his first motorcycle on the Ides of March in 1995— when he gazed at a police officer giving a poor soul a ticket. The woman in front of him suddenly put on her brakes and Larry slammed into her trunk resulting in his broken pelvis, a demolished motorcycle and a lost teacher spring break. Fortunately, no surgery was needed and the wider pelvis would enable Larry to have our next child. Every time we went through Sturgis on our way to Montana, I would have to wipe off the drool from Larry’s chin as he lusted after another motorcycle. But Larry wanted his wife as a partner, and he waited twelve years for me to finally give consent. Now I have to admit, I love the freedom and fun of a motorcycle myself. .Over the past twelve years, gravity has played havoc with Larry’s 6’ 2”, 240 lb. frame. To get on his motorcycle, he grabs his pant leg and throws it over the seat and does a little jig when a cramp sets in. I’ve promised to teach him yoga and stretch moves to remedy his condition but he shows little interest in learning. Getting off the motorcycle is also a trick since the body wants to stay in the bent over position. Other than that, we had a wonderful time enjoying the onset of fall and the flocks of pelicans landing on the Mississippi river. 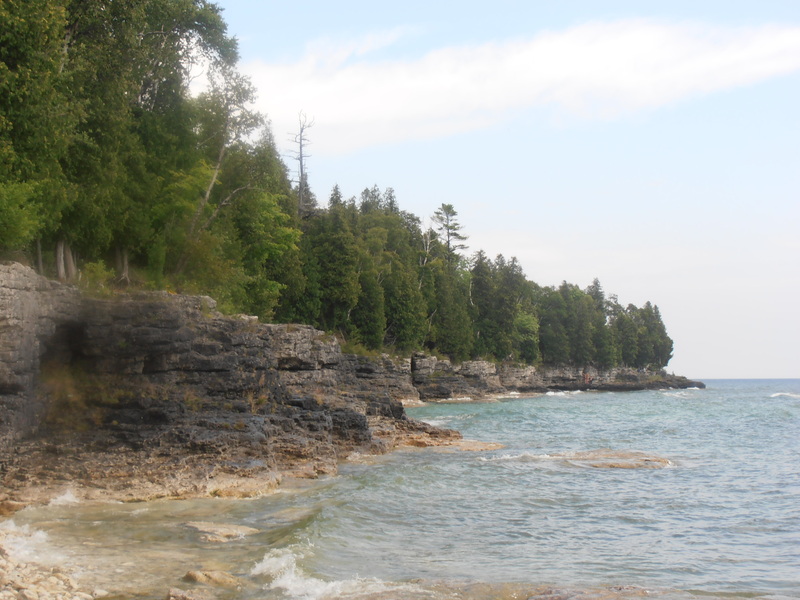 The first night we camped at Governor Dodge State Park right along the cliffs. It was late September and we had the place to ourselves. We pitched our backpacking tent and made an attempt to sleep well on insulate which is like sleeping on old cardboard boxes. Following tradition, we strained to read before bed with our trusty headlamps and foggy glasses. I dreamed of our first motorcycle trip to Galena twenty years earlier when we traveled with four other couples surrounded by a lightning filled rainstorm. I was young enough not to worry too much about the metal tent poles attached to the back of the motorcycle. There are some advantages to growing old—such as gaining wisdom. I highly recommend a trip from La Cross to Prairie Du Chien and then over the bridge to see the Indian Mounds in Iowa. From there, continue on to Galena and back to the land of more sophisticated names for rivers and roads. By the way, the lowest gasoline prices were in Dubuque, Iowa —just $3.66. You might also find a deal on a motel, but then you’d miss the beauty of being so close to nature at its best. Since writing this post, we have a better motorcycle which is much more comfortable for me. We just took a trip up to Delafield through Kettle Moraine and to Lake Geneva WI. It was a beautiful July day and we celebrated our anniversary by walking around part of the lake and going to Tuscany’s for dinner. Life is good and the gas less expensive in Wisconsin.